A. A rare 1851 map that shows McDonald County when the county was still a part of Newton County. B. A map of 1913 McDonald County showing the locations of 21 different settlements including all of the following: Anderson * Bethpage * Caverna * Coy * Cyclone * Erie * Goodman * Hart * Jane * Lanagan * May * McNatt * Mountain * Noel * Pineville * Powell * Rocky Comfort * Saratoga * Simcoe * Southwest City * Splitlog * Tiff City. C. A map from the 1920's which includes details of where various tourist sites and service stations were located. D. A 1929 map from the Missouri Department of Transportation. You will be amazed at how many of the major routes were only dirt or gravel! Included here are five pages plus several pages of rare and fascinating photos concerning McDonald County from the 1913 edition of The Missouri Red Book and contains about every imaginable statistic you could want for this time period. Some of the facts contained are the number of farms and their acreages, number of cows, horses, mules, pigs, sheep, goats, poultry, colonies of bees, how many farms had mortgages and how many were free of debt, the amount of butter produced, the number of bushels of apples, peaches, pears, etc. harvested, the number of quarts of blackberries harvested, the number of schools and teachers, plus hundreds of other detailed statistics. A wealth of information! Section Three of six, ALL on one CD: Postcard Views of McDonald County, Missouri. More than 150 postcards show vintage scenes of McDonald County from the early 1900's to the 1980's. Greatest emphasis is on the Noel, Lanagan, Anderson and Pineville areas. Many rarely seen McDonald County cards are included. Every card is shown at full size and in full color. 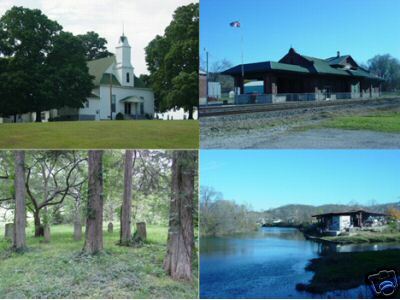 Section Four of six, ALL on one CD: A pictorial view of McDonald County, Missouri. More than 140 full color photos show the McDonald County of today and includes photos of numerous sites including historical buildings, churches, cemeteries, scenic views, and includes photos from the Anderson, Bethlehem, Bethpage, Goodman, Lanagan, McNatt, Noel, Pineville, Rocky Comfort, Simco, Southwest City, Splitlog, and Tiff City areas. All of these photos were taken in 2003. Section Five of six, ALL on one CD: An historical and pictorial view of Ginger Blue Lodge. Founded in 1915, the famed Ginger Blue Lodge became widely known as one of the premier resorts in the region. This book tells the history of the lodge thru numerous photographs and postcard views. Also included on this CD are views of two rare complete Ginger Blue Lodge brochures. The main lodge of Ginger Blue burned to the ground on the evening of July 13, 2003. Photos of the charred remains of the main lodge plus the remaining cabins are included. Section Six of six, ALL on one CD: The complete 1888 Goodspeed's History of McDonald County, Missouri. This detailed (207 pages in all) book has an incredible amount of historical and genealogical information about McDonald County from its earliest settlement up to 1888. This has all of the pages pertaining to McDonald County, Missouri including all of the historical and biographical information. Military Affairs (Civil War history) including movements of Union and Confederate forces and including battles and skirmishes. History of McDonald County Cities and Towns including: Bethpage, Elk Mills, Erie, Indian Springs, Pineville, Rocky Comfort, Rutledge, Saratoga Springs, Southwest City, Splitlog, Tiff City, plus other old settlements. Ballard * Barr * Barton * Batten * Bookout * Boone * Burns * Caldwell * Caulk * Chenoweth * Childers * Christian * Cloud * Cloyd * Collins * Corum * Cox * Crispin * Crumbaugh * Davidson * DeGroff * Dustin * Duval * Elliff * Epperson * Falkenbury * Fink * Ford * Fox * Fullerton * Gist * Hall * Hanna * Hargrove * Harmon * Hart * Havens * Howard * Jackson * Jones * Kenney * Kunkel * LaMance * Lamberson * Lamson * Langley * Laughlin * Long * McCall * McKinney * McNatt * Magee * Maidt * Manning * Marshall * Martin * Maxfield * Maynard * Nichols * Noel * Oyler * Patterson * Paul * PeTit * Plater * Plumlee * Pogue * Polson * Price * Quarles * Reece * Seabourn * Seaman * Shields * Slinkard * Smartt * Smith * Testerman * Vanpool * Walker * Warren * White * Williams * . The cost for this CD containing ALL six sections described above is only $9.95 plus shipping, or only $5.95 as a digital download! A large amount of history and genealogy information for very little cost! A truly fascinating view of McDonald County, Missouri from its first settlement to 1888. Also includes considerable information concerning the Civil War in McDonald County, Missouri. Shipping is only $1.95 for First Class Mail in the United States and Canada. Outside of the United States, please contact us for shipping costs. We accept checks, money orders and all major credit cards via the shopping cart, mail, or by phone at 816-204-7593. Since we offer many different county history and genealogy CDs, please be sure to specify that you wish to order the McDonald County, Missouri History, Genealogy and Maps CD. If ordering more than one, the shipping cost is $1.95 for the first CD plus only 25 cents shipping for each additional CD purchased.